The first photographs that surfaced on Abu Ghraib in the spring of 2004 were so jarring, I thought at first that they were doctored. The hope was that these were some propagandistic, photo-shopped images designed to put the U.S. in the worst possible light. Ten years later, and we as a nation are still struggling over the issue of detentions and interrogations that cross the line into the realm of torture. While it was military intelligence and their contractors in the docket at Abu Ghraib, the report by the Senate Intelligence Committee this week confined itself to those practices employed by the CIA. Most Americans would like to agree with these sentiments; that we do not torture, that this report does not reflect the values of the nation. However, several points in the report may indicate otherwise, that these practices likely occurred more often than we know. 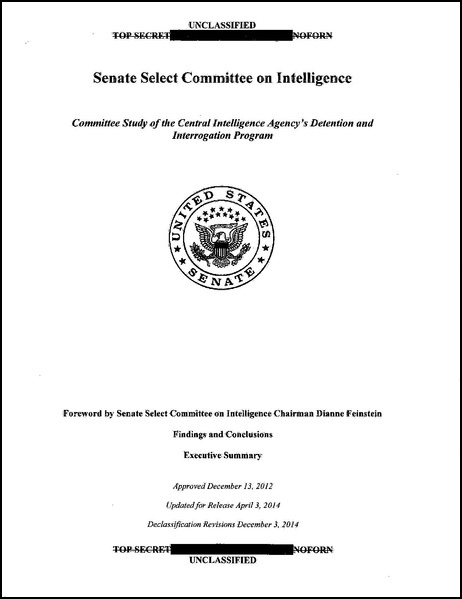 Senator Feinstein in her statement from the Senate floor on December 8 made two references that suggest a larger history of use of torture methods by the CIA. Both were embedded in communications from a high-level CIA official, John Helgerson. First, she made the point that the agency did not even learn from its own history, citing an e-mail from Helgerson to the CIA Director Michael Hayden in 2005, “… we have found that the Agency over the decades has continued to get itself in messes related to interrogation programs for one overriding reason: we do not document and learn from our experience – each generation of officers is left to improvise anew, with problematic results for our officers as individuals and for our Agency.” (emphasis mine) At the time, Helgerson was the Inspector General (IG) of the agency and was conducting a review of the practice in his capacity as an independent, internal watchdog reviewing government programs for waste, fraud and abuse. Helgerson’s review of the detention and interrogations program at the CIA may have been too intrusive as the CIA Director Hayden himself launched an inquiry into its own Inspector General’s office, according to the New York Times. Agency then developed the Human Resource Exploitation (HRE) . Not only was the U.S. involved in such interrogations but we were training foreign countries on the methods. Such training ended in 1986 when abuses were identified in Latin America. Helgerson’s 2004 report also referred to the 1984 investigation of two CIA officers who had been investigated following the death of an individual they interrogated. Senator Feinstein’s second reference to Helgerson may shed light on specific timing of other previous incidents. She cited a letter he sent to the Senate Intelligence Committee on January 8, 1989. Helgerson, then the Director of Congressional Affairs at the CIA, was evaluating the effectiveness of such techniques, concluding that “inhumane physical or psychological techniques are counterproductive because they do not produce intelligence and will probably result in false answers.” Helgerson’s letter was in response to a committee inquiry over a topic that remains unnamed. We do know that Helgerson had been called to hearings in the late 1980s on the Iran-Contra funding and on the role of the CIA in drug trafficking, but there is no indication that his reference to inhuman techniques was in either of those contexts. The references to John Helgerson in the Senate report released this week do seem to indicate that we have a broader history with these interrogation practices than we know about. In that light, they do also require us to reconsider who we are and who we aspire to be. Such a reconsideration may require more actions than just releasing this report. Short of prosecuting individuals involved, though, two other steps would help to realign our actions with who we aspire to be. First would be the ratification of the Optional Protocol to the Convention against Torture and Other Cruel, Inhuman or Degrading Treatment or Punishment, that calls on countries to allow for inspections of detention facilities as a means to prevent torture. While we ratified and signed the original convention in 1994, we have yet to approve this addendum that came into force in 2006. A second step would be to move as fast as possible to close the prison at Guantanamo, putting terror suspects into the U.S. judicial system. The politics of these steps make their likelihood remote indeed. However, in order to assure that the U.S. really is committed “never again” to torture, such actions may be necessary. Then our conduct would more closely align with who we think we are and who we aspire to be. This entry was posted on December 16, 2014, 12:59 am and is filed under International, Public Affairs. You can follow any responses to this entry through RSS 2.0. You can leave a response, or trackback from your own site.